Montañola-Sales, C.; Casanovas, J.; Cela, J.; Onggo, B.; Kaplan, A.
Agent-based modelling and simulation is a promising methodology that can be used in the study of population dynamics. One of the main obstacles hindering the use of agent-based simulation in practice is its scalability, especially if the analysis requires large-scale models. A possible solution is to run the agent-based models on top of a scalable parallel discrete-event simulation engine. 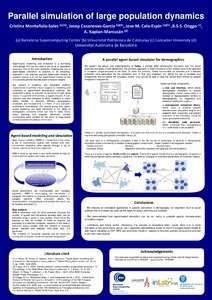 In this paper we present a modelling and simulation platform implemented to provide a basic support for M&S of agent-based demographic systems. As a simulation application, we conducted a study to evaluate its performance in a parallel environment: a supercomputer. A user interface was also designed to allow modellers to easily define models to describe different demographic processes and transparently run them on any computer architecture environment. Our results prove that agent-based modelling can work effectively in the study of demographic scenarios which can help to better family policy planning and analysis. Moreover, parallel environment looks suitable for the study of large-based individual-based simulations of this kind. Montañola-Sales, C., Casanovas, J., Cela, J., Onggo, B., Kaplan, A. Agent-based simulation of large population dynamics. A: European Conference on Complex Systems. "ECCS'13 Book of abstracts". Barcelona: 2013, p. 141-142.